Last week, Andrew Kaczynski at CNN reported that Monica Crowley, President-Elect Donald Trump’s pick for senior director of strategic communications for the National Security Council, had committed plagiarism in her 2012 book entitled What The (Bleep) Just Happened. In the report, Kaczynski highlighted approximately 50 instances where there was text copied, without attribution, from a variety of sources. Indeed, the scandal was shrugged off even before it was first reported and there’s little likelihood that the plagiarism, as clear as it is, will have any impact on Crowley’s future. That’s why, as interesting as Crowley’s story is, the real news is the reaction to it. The Crowley scandal, much like the Melania Trump scandal, point to a shift in the way plagiarism is viewed and it’s become very clear that shift means plagiarism is no longer the career-ender that it once was. In fact, for some, plagiarism isn’t even a speedbump on their way to the top. The facts of the Monica Crowley plagiarism scandal are fairly straightforward. In 2012 Crowley published a book entitled What The (Bleep) Just Happened, a book that responds to the re-election of President Obama from the eyes of a conservative. The book contains no footnotes or in-text citations, but, as Kaczynski’s reporting clearly shows, contains significant copied text. 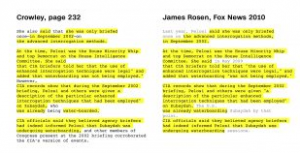 The pattern of copied text is consistent with text copied early in the writing process and then edited and manipulated as time went on and multiple passes through the book were made. This means, almost certainly, it was Crowley or her ghostwriter who put the text in the work, not an editor down the line. Sadly, this wasn’t Crowley’s first run in with plagiarism. In 1999, Crowley published an article for the Wall Street Journal on the 25th anniversary of Nixon’s resignation. However, Slate pointed out similarities between that article and a 1988 one by Paul Johnson in Commentary magazine. That led to an editor’s note in the WSJ though Crowley denied the allegations of plagiarism, saying that she never read Johnson’s article. With the Trump Administration standing by Crowley, the only question is what HarperCollins will do. So far, the company is saying that it’s been made aware of the issue and is looking into it. This story, along with others from the past few years, has illustrated that, plagiarism scandals, as we once knew them, are likely a thing of the past. In many ways, Jonah Lehrer may be considered “peak plagiarism”. It was a plagiarism scandal that unfolded much like Jayson Blair did in 2003, but it was a truly modern story involving a famous freelance reporter who had risen to stardom only to have his career dashed on the rocks by plagiarism. But it would also be the last time such a promising career was so completely destroyed (outside of a 2016 book that has not been well-received). In 2015 BuzzFeed editor Benny Johnson was fired over plagiarism, only to receive a new job almost immediately at the National Review. CNN has also faced its own challenges in this area. In 2012, shortly after Jonah Lehrer, Fareed Zakaria faced allegations of plagiarizing a paragraph in an article for Time Magazine. Zakaria apologized and was suspended by CNN but reinstated after an investigation. Then, two years later, he faced another set of allegations, involving both columns of his from 2011 and 2012 as well as his book, The Post-American World. Though the allegations weren’t as solid as the first, there was still not significant response to the allegations other than notes being affixed to much of his work he contributed to other organizations. Zakaria continues to prominently work with CNN and other news organizations today. In politics, things haven’t fared much better. “Peak plagiarism” there will likely be Senator John Walsh, who was forced to drop an election bid following a plagiarism scandal over his thesis at the Army War College. That plagiarism eventually cost him his degree as well. However, Senator Walsh’s campaign was already struggling and behind, much like Joe Biden’s in 1987, when Biden abandoned a Presidential bid. Biden’s plagiarisms were re-raised in 2008, in a cycle that also saw President Barack Obama and Senator John McCain also accused of plagiarism. However, those scandals were lacking in evidence or significance. None of those scandals had a significant impact on the 2008 election. 2016 was something of a resurgence for plagiarism in Presidential politics with accusations that Melania Trump’s speech at the Republican National Convention was plagiarized in part from Michelle Obama’s 2008 speech at the Democratic National Convention. While embarrassing and distracting, it did nothing to alter the course of the campaign. And now, we have Crowley. A serious plagiarism accusation, a second for her, that was dismissed before it was even published. So, how did we get here? Why was plagiarism, once a career-killer, now, in some cases, a speed bump dismissed even before a story breaks? It’s a complicated question, but there are several factors at play. While that much seems mostly self-evident, the question is how we got there? The answer, is multi-part. Plagiarism Scandals/Stories Became More Common: Plagiarism detection software is ubiquitous, easy to use and, in many cases, cheap. Finding and detecting basic plagiarism is easy and, in a time where everything is written down, it’s trivial to find cases of plagiarism. That’s led to a rise in plagiarism allegations, which has made them seem more common, producing an air of “Everyone does it” even if that’s far from the truth. False or Borderline Stories Spread Quickly: Stories like Obama and McCain’s plagiarism scandals poisoned the well by attracting large amounts of attention to scandals that just weren’t there. Even as Crowley faces serious allegations, many point to Obama’s scandal as a counter, though the two are very different, even on a cursory analysis. This attention has led to a false equivalency, one I worry I may have inadvertently contributed to, and both made it seem more common and like all plagiarism stories are the same, trivial. Political Rhetoric: Once upon a time, calling someone a plagiarist is tantamount to calling them a liar and a fraud. However, in today’s political climate, liar and fraud are two of the tamer insults. In a year that talked about putting candidates in jail and sexual assault, “plagiarist” doesn’t even register as an insult. Whose Text Is It Anyway: As with Melania Trump, Fareed Zakaria and similar tales, the stated author of the piece may not have written it. The opaque writing process of many authors makes it difficult to know just who to assign blame to, making many of the stories seem blameless. In short, the rise in the number of plagiarism scandals, especially those of questionable importance, have hurt the gravity of the allegation while the political and journalism climates have made it far less of a transgression. Couple that with widespread ghostwriting and you have an atmosphere that’s ripe to devalue plagiarism as an ethical failing. Unfortunately, the complicated and multi-pronged nature of the problem makes it difficult, if not impossible, to come up with a simple solution. However, there is a ray of hope and it’s in the places that do still deeply value academic and creative integrity. Since the Crowley dust-up began, Politico has published details of similar plagiarism allegations involving Crowley’s dissertation. Written in 2000 for Columbia University, Politico was able to find a dozen instances where Crowley copied, without proper citation, from other sources. Though Crowley often cited the source in her footnotes, she did not indicate that she was quoting the source. This practice, and the allegations thereof could pose a serious challenge for Crowley. While allegations in her book may be easily dismissed (except, perhaps, by her publisher) allegations in her dissertation could mean she loses her degree. Rescinding degrees for plagiarism, such as with Senator Walsh, is not uncommon and, if Columbia investigates and finds the plagiarism extensive enough, it certainly can do so. Academia is one area where the importance of plagiarism has not waned and, if anything, has grown. This is especially true in research, where plagiarism has been a hot topic over recent years, especially internationally. Still, academia does seem to take plagiarism serious. Failed grades, suspensions and expulsions are common in the classroom while retractions and firings are common in research. While it’s difficult to say why this is the case, the reasons in the list above do offer a clue. Other than possibly “fabricator”, there is no worse insult in academia than “plagiarist” (at least not pertaining to the job itself), while the number of scandals have grown, a better system for investigating and enforcing them have kept false ones to a minimum. Academia isn’t perfect when it comes to plagiarism, but it’s work and its systems have protected it from the aloofness that has overtaken journalism, politics and the general public. While it doesn’t provide a complete answer, it does show that having systems for investigating plagiarism (as well as trust in those systems) can go a long way to maintaining respect for originality. Most people do find plagiarism offensive and do think less of plagiarists. The problem is that it’s now very low on the list of things that impact one’s perception, especially when looking at a political candidate. But part of the problem is that a plagiarism accusation, by itself, is fairly meaningless. All accusations are given the same gravity, regardless of evidence, and how one views the story is often more impacted by their politics than the facts. In that environment, there’s no way plagiarism can be taken very seriously and it’s no surprise that often, it is so quickly dismissed. Regardless, at the end of the day, plagiarism is unethical. When plagiarism involves the infringement of copyrights, victims have extensive rights and recourse. Best advice: write your own stuff or get permission before using the stuff of someone else. * Reprinted with permission. Jonathan Bailey, copyright and plagiarism consultant at CopyByte. His expertise includes content tracking, content enforcement, expert witness testimony and public speaking. To learn more about Jonathan Bailey go to https://copybyte.com/. Edited by Eugene F. Ferraro. Publisher, HarperCollins has since pulled the book, and it is no longer available. Faith is the complete trust or confidence in someone or something. It is the belief in God, his power and his mercy. It is the ability to believe when no one else believes. Faith is the assurance of things hoped for and the conviction of things yet seen or realized. It is neither oppressive nor coercive, for it is an unshakable belief. Thus, through life we walk by faith, not by sight. Ned was born in Boston on Oct. 7, 1931. The son of a marine architect and Navy officer, he was raised to respect his parents, treat others with kindness and love God. He was handsome, athletic and smart. He graduated from the U.S. Naval Academy in 1954 and arrived in Vietnam in September 1967 aboard the nuclear-powered carrier, the USS ENTERPRISE. The ENTERPRISE had arrived on Yankee Station on December 2, 1965 and at the time, the largest warship ever built. She brought with her not only an imposing physical presence, but also a lethal component of warplanes and advanced technology. By the end of her first week in hostile waters, the ENTERPRISE had set a record of 165 combat sorties in a single day. By the end of her first combat cruise, her planes and aircrews had flown over 13,000 combat missions. But the record had not been achieved without cost. On March 17, 1968, Ned and his Bombardier/Navigator, Dale Doss, launched in their A6A Intruder on a night, low-level strike into the heart of North Vietnam. After their departure, they emitted their first radio transmission indicating that they were “feet dry” and over land, proceeding stealthily to their target, a rail yard just north of Hanoi. It would prove to be their final communication. Undated U.S. Navy photograph of Ned beside his A6 Intruder. The following day, Radio Hanoi announced the capture of Ned and his bombardier. Following what had begun as his 18th combat mission, suddenly he had become a prisoner of war. Both Ned and Dale were transported to a filthy place near the center of Hanoi, called by its prisoners, the Hanoi Hilton. There Ned (like Dale and hundreds of others) was beaten, tortured and held in solitary confinement. After 17 months, he and Dale were reunited and joined some of their fellow prisoners. For what seemed like ever, that sat, waited and gave emotional support to one another. Then a miracle occurred. Shortly before Christmas in 1970 Ned and 42 other American prisoners of war decided to break prison rules and hold a brief service in celebration of the birth of their savoir. But their barbaric and inhuman guards stopped them. In their presence, Ned stepped forward and asked his emaciated fellow servicemen, “Are we really committed to having church Sunday? I want to know person by person.” Fellow prisoner, Leo K. Thorsness, later recounted in a memoir, “When the 42nd man said yes, it was unanimous. At that instant, Ned knew he would end up in the torture cells.” The following Sunday, Ned stepped forward to lead a prayer session and was quickly hustled away by angry guards. The next four ranking officers did the same, one by one, they too, were taken away to be beaten. And then, Thorsness remembered, the sixth-ranking senior officer began, “Gentlemen, the Lord’s Prayer…and this time, we finished it.” The guards relented and no one was punished. Lt. 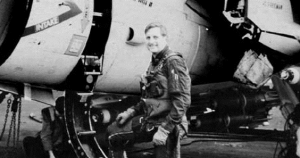 Commander Edwin A. Shuman III remained incarcerated at the Hanoi Hilton for more than two more years. But it was Ned, the downed Navy pilot, of impeccable courage and unshakable faith who had by then won the prisoners’ privilege to collective prayer. Note: This piece was taken from the third chapter of Gene Ferraro’s book entitled, Virtues & the Virtuous: Inspiring Lessons and Insights about Virtue, Virtuosity, and the Essence of the Human Spirit (Volume 1). Virtues is Gene’s 15th book. It can be found on Amazon. A portion of each sale is donated to one of several non-profits which Gene supports. Volume 2 of the series will be released in January 2017. “I am incredibly nervous that we will implode in a wave of accounting scandals…the business world will consider [our] past successes as nothing but an elaborate accounting hoax,” Sherron Watkins of Enron Corporation wrote in a six-page letter dated August 15, 2001. Watkins, Enron’s vice president of corporate development, sensed that the end was near for her firm, but even she did not know the extent of it. Enron Chief Executive Kenneth Lay, and his top lieutenants, had engineered one of the world’s largest fraudulent corporate accounting schemes in history. Enron’s ultimate collapse resulted in the loss of $61 billion in shareholder value and the elimination of more than 5,000 jobs. Sixteen employees pleaded guilty for crimes committed at the company. Several top executives, including ex-CEO Jeffrey Skilling, landed in prison for their roles in the scheme and for lying to employees and investors about Enron’s financial health. Skilling was sentenced to 24 years in prison and fined $45 million. As detailed in his seminal book Conspiracy of Fools, author Kurt Eichenwald revealed that greed and ambition were not the only reasons for Enron’s failure. Another crucial factor was the absence of an ethical culture, which ultimately enabled the wrongdoing. In the 15 years since Enron’s epic failure, the importance of maintaining an ethical culture continues to grow. As the world of security changes, corporations change, management approaches change, and technologies change. To remain ethically sound, organizations need more than a fixed set of specific rules contained within their codes of conduct. Security managers should take the lead in actively managing their department’s culture so that sound ethics are firmly embedded in all operations, which are in turn aligned with the organization’s values and mission.